Lok Satta Party national President Dr. Jayaprakash today lashed out TRS President K. Chandrasekhara Rao for unabashedly justifying dynastic politics. The Constitution, democracy and elections become meaningless if family rule is deemed as a birth right, Dr. JP fumed at a media conference. Dr. JP called upon every father and mother and young boy and girl to reject with a vengeance those who seem to claim they have a divinely-ordained right to rule. Otherwise, they continue to be palanquin bearers of the ruling elite only. 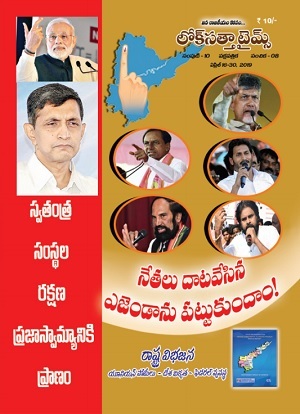 Dr. JP said the malaise is not confined to Andhra Pradesh. As many as 167 members of the outgoing Lok Sabha owe their position to their political lineage. The other malady afflicting the Indian political scene is parties encouraging only those who have amassed billions of rupees either legally or illegally and who are prepared to buy their way into legislatures. The culture is spreading because political parties have become utterly selfish and arrogant and look down upon ordinary voters with contempt. Dr. JP called upon political party members, people in general and youth in particular to fight such tendencies. People have already begun to hate political parties and politicians. If the rot is not arrested, anarchy will break out, he warned. Dr. JP in this context referred to irregularities in the entrance examination for post-graduate medical admissions and demanded that the guilty be swiftly identified, jailed and their properties confiscated. There should be a fresh entrance examination if those who did not manipulate the ranks through malpractices cannot be declared passed. In the absence of sure and swift punishment, people will lose faith in all institutions holding examinations either for Government jobs or seats in educational institutions. 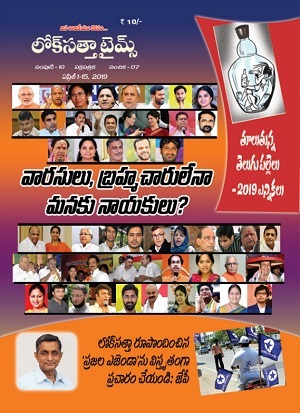 Dr. JP confirmed the Lok Satta party in is touch with the BJP and the TDP on electoral adjustments in the upcoming general elections. Asked how he could support a ‘divisive’ party like the BJP or join hands with the TDP which too is encouraging dynastic politics, Dr. JP said he had gone through a cruel dilemma before arriving at the decision. The country’s need of the hour is economic development, job creation and good governance. As the Lok Satta Party is not in a position to contest all the seats now for reasons beyond its control, it has to win at least a few seats to make its voice felt in national interest by aligning with those who are committed to development. The Lok Satta will walk out if any party pursues divisive politics. He welcomed movie star Pawan Kalyan entering politics to serve the nation. He said the Lok Satta could not envisage adjustments with Leftist parties which believe in Luddite politics. Dr. JP utilized the occasion to drive home the point that he is instrumental in the launching of development works worth Rs.1573 crore in Kukatpally constituency, which he represents in the Assembly. While works worth Rs.956 crore have already been completed or in final stages, works worth Rs.617 crore are under way. He has helped improve drinking water supply in the constituency from 80 lakh gallons to 180 lakh gallons per day – an improvement of 125 percent which is not witnessed anywhere in the State. Dr. JP said he had got works worth Rs.3.17 crore sanctioned/executed against the Rs.3 crore he had received as Constituency Development Fund in the last three years. Works costing Rs.1 crore, released recently for 2013-14, are being taken up now. Lok Satta Party leaders Katari Srinivasa Rao, D. V. V. S. Varma, Bandaru Ramamohan Rao and Y. D. Rama Rao took part in the media conference.